This is a light healthy meal, perfect for summer lunch or dinner. You will need only 45 minutes to make this meal for 4 persons. 1. Wash the tomatoes and cut the lids. Remove the seeds with a spoon, then salt lightly and place cut side down in a colander to drain. 2. Cut the bread into small dice, and crush the garlic in a bowl. Heat the olive oil in a skillet. Add the bread dice and garlic, and saute until it is golden. Remove and drain on paper towels. 3. Preheat the oven to 200 Celsius. Cut the goat’s cheese into small pieces. Wash the basil; shake dry and cut the leaves into thin strips. carefully combine the cheese, basil and croutons. 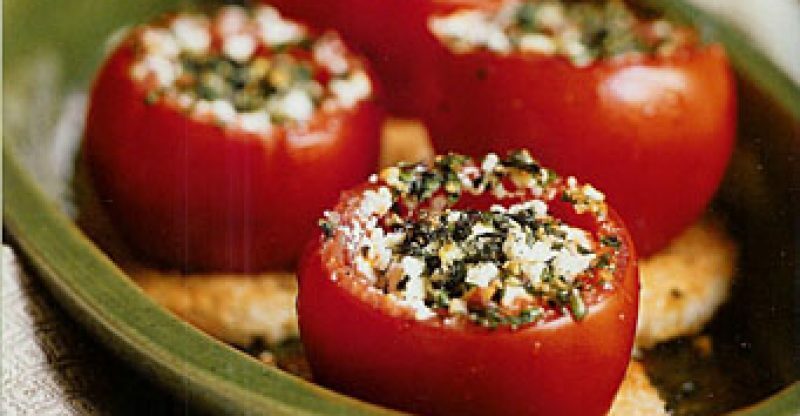 Season to taste with salt and pepper and spoon into the tomatoes. Brush an ovenproof dish with oil and place tomatoes inside. Bake in the preheated oven for 20 minutes and serve hot.